Posted on Wednesday, April 25th, 2012. Once you have come to grips with the basics of the new Facebook Pages there are some other features available in the new page design that you should learn about and these additional features are really worth a look at as they will add to the usefulness of your Facebook Page. 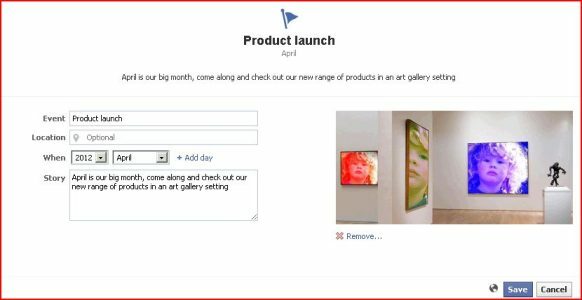 These additional features will ensure that your business will make the most of Facebook as a solid Social Media Marketing NZ tool. When the public visits your new business Facebook page, they will have a more personal experience. They will see how their own Facebook friends have interacted with your page. If someone tags your business page in their own post or checks in at your business, the people they originally shared with will see these stories highlighted for them on your business page’s timeline should they visit it. You will learn more about your page’s visibility settings here and what other people can see. If a visitor to your page sees that they have a friend who has engaged with your Facebook page, they may be more inclined to browse your page and then become a fan. The new design allows admins to feature what are called “Milestones” on their page. This feature is all about allowing a business to highlight some of their significant moments and accomplishments, like fan growth, product releases or when they were founded. Milestone images are required to be set at 843 x 403 pixels. You create your milestones by accessing the status update box, you will then be prompted to input the following information about your milestone, Event, Location, When and Story. You can add a picture, below is an example of how the Milestone may look. The activity log allows you to view, manage, and organize all the posts on your page. To access the Activity Log, go to the Admin panel and select Manage then Use Activity Log. Through the Activity Log you can filter stories by date or type. You can view Info updates, comments and many other options by clicking the drop down arrow on the “All” menu.